Not to be confused with Aero Lloyd. For the Brazilian defunct airline, see LAB – Linhas Aéreas Brasileiras. 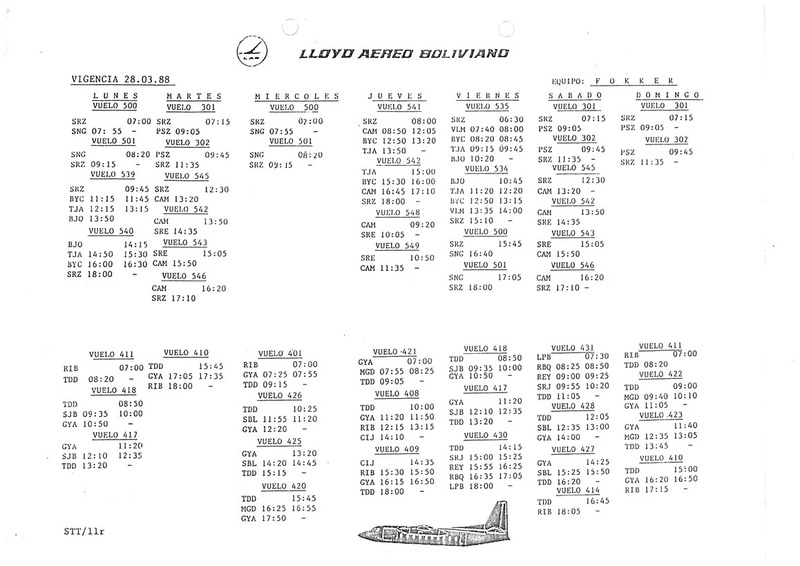 Lloyd Aéreo Boliviano S.A.M. (abbreviated LAB and internationally known as LAB Airlines), was the flag carrier and principal airline of Bolivia from 1925 until it ceased operations in 2010. Before its demise it was headquartered in Cochabamba and had its main hubs at Jorge Wilstermann International Airport and Viru Viru International Airport. Founded in September 1925, it was the second oldest airline in South America after Avianca and one of the oldest airlines in the world. 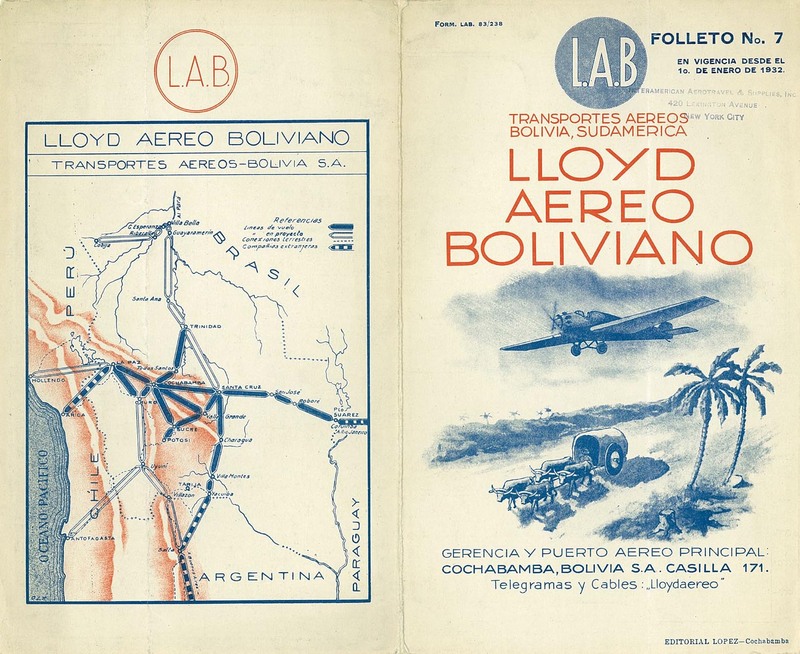 Lloyd Aéreo Boliviano was founded by Guillermo Kyllmann in Cochabamba on September 15, 1925. The name was chosen after the British insurance market Lloyd's of London for its image of safety and security. Flight operations were launched on 23 September using Junkers F.13 aircraft, the first of which had been a present from the German community in Bolivia. 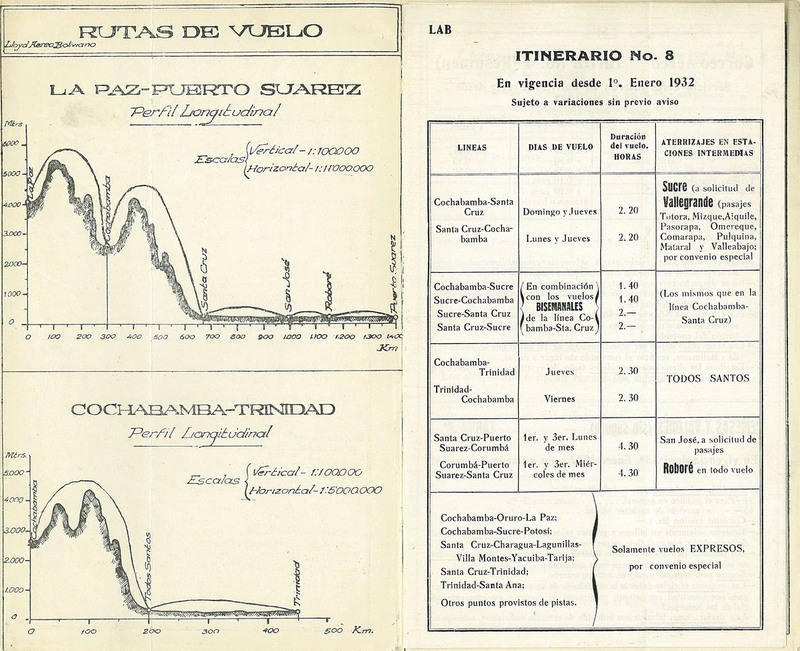 In July 1930, Lloyd Aéreo began to serve international routes, with scheduled flights between La Paz, where it was based then, and Corumbá, Brazil. On the grounds of a co-operation agreement with Syndicato Condor, an airline catering for the German minority in Brazil, LAB passengers could connect in Corumbá on a flight to Rio de Janeiro, and vice versa. 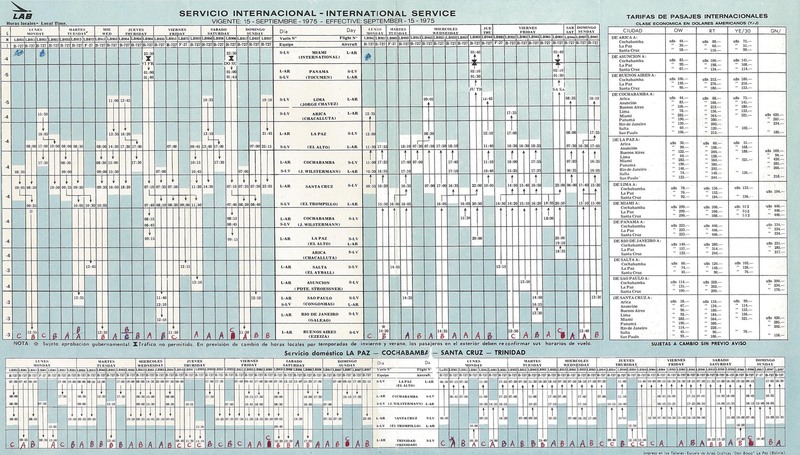 Over the following years, more destinations in Brazil were added, so that Lloyd Aéreo became the second largest airline in South America at that time, only surpassed by Avianca from Colombia. In 1932, the Bolivian government seized all of LAB's planes and staff, so that they could be dispatched for military use during the Chaco War with Paraguay. 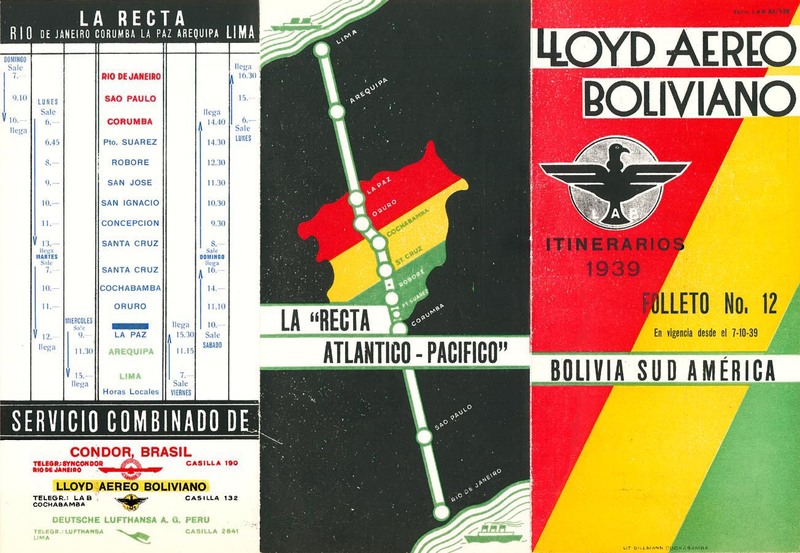 On 14 May 1941, Lloyd Aéreo Boliviano was reorganized as a state-owned company and became the flag carrier of Bolivia, which led to an expansion of the destinations served, as well as a fleet modernization. For its merits for the nation, LAB was awarded the Order of the Condor of the Andes in 1950. With the Lockheed L-188 Electra joining the fleet in September 1968, LAB was in the position to offer non-stop international flights. A further improvement in comfort and travel times was achieved when Lloyd Aéreo acquired its first jet aircraft (of the Boeing 727 type) in 1970, allowing for the inauguration of flights to Central America and the United States. From 2006, Lloyd Aéreo had to cut flights because it was in bad financial shape; leased long-haul aircraft (a random mix of Airbus A310, Boeing 757, Boeing 767 or Lockheed L-1011 TriStar at that time) could not be paid for anymore. On 30 March 2007, it was decided by the Bolivian government to shut down Lloyd Aéreo Boliviano, which meant that effective on 1 April, all flight operations were suspended. In October of the same year, Boliviana de Aviación was established as new national airline of Bolivia. LAB operated a limited number of charter flights during late 2007 and early 2008 on behalf of AeroSur, but has since fully gone out of business, with its airline license officially been revoked in 2010. In Corumba, passengers could connect on Syndicato Condor flights to destinations within Brazil and even to Europe. Similarly, in La Paz, connecting flights to the Peruvian towns of Arequipa and Lima were offered in co-operation with Deutsche Lufthansa Peru. Like LAB, these airlines were aiming at the German minorities in the respective countries. By then, Santa Cruz had replaced Cochabamba as the largest hub for Lloyd Aéreo Boliviano (now flag carrier of Bolivia), with another one having been opened at Trinidad Airport, and international routes being offered from La Paz Airport. The domestic network had grown to extensive size, covering most airports in the country (still relying on multiple-stopover flights). More international routes had been added, with LAB now also offering flights to Chile, Argentina and Peru. The following destinations were served on a scheduled basis in 1964, using Douglas DC-3, DC-6 or Boeing B-17G (the latter being military cargo aircraft, which could also accommodate passengers). During the 1970s, LAB's President Mario Patino Ayoroa  developed the company's routes and made it an international player. The international network saw further expansion, most notably with the launch of scheduled flights to the United States. At that time, the LAB network had been consolidated, appearing more or less in the shape it would retain until the 2000s. The largest Bolivian cities were linked with destinations all over South America, as well as in the United States (international flights usually had several stopovers). International flights as well as hub-to-hub flights were operated using Boeing 727 aircraft, whilst the Fokker F-27 and the similar Fairchild F-27 were deployed on the domestic network. From 1990, Lloyd Aéreo Boliviano moved its main hub in Santa Cruz de la Sierra from El Trompillo Airport to Viru Viru International Airport. On 21 August 1944, an LAB Lockheed Model 18 Lodestar (registered CB-25) was destroyed in a fire at La Paz Airport. On 29 May 1947, an LAB Douglas C-47 Skytrain (registered CB-32) crashed near Trinidad. On 10 August 1949, an LAB Curtiss-Wright C-46 Commando (registered CB-37) crashed near Rurrenabaque. In September of the same year, a Lodestar (registered CB-26) was damaged beyond repair in a shooting during the Bolivian National Revolution. In 1950, two LAB C-46s crashed: The one registered CB-51 near Cochabamba on 24 April, its sister aircraft CB-38 on 2 October near La Laguna Lake. On 1 January 1951, an LAB C-47 (registered CB-31) was damaged beyond repair in a crash-landing at La Paz Airport. On 3 November 1953, a Lloyd Aéreo Boliviano Douglas DC-3 (registered CP-600) crashed into a mountain near Potosí, killing the 25 passengers and 3 crew members on board. The aircraft had been on a scheduled domestic flight from Camiri to Sucre. On 5 September 1955, two LAB aircraft collided mid-air over Cochabamba: A DC-3 (registered CP-572) on a scheduled passenger flight, and a Boeing B-17G (CP-597) on a cargo flight. The Boeing crashed, killing all three crew members. The DC-3 managed to perform an emergency landing. On 25 August 1956, a cargo-configured Lloyd Aéreo DC-3 (registered CP-506) crash-landed at La Paz Airport, killing two out of the three people on board. On 26 September 1956, the first hijacking of a commercial flight with political purposes was of the Lloyd Aereo Boliviano on 26 September 1956. The airplane (DC-4), carried 47 prisoners. They were being transported from Santa Cruz, Bolivia to the town of El Alto, in La Paz. There, a political group was waiting to take them to a concentration camp located in Carahuara de Carangas, Oruro. The 47 prisoners gained control of the aircraft in mid-flight and rerouted the airplane to Tartagal, Argentina. Two of the 47 prisoners took control of the aircraft controls and received instructions to again reroute to Salta, Argentina as the airfield in Tartagal was not big enough for the DC-4. They did and moments later arrived safely to the city of Salta. They told the government of the injustice they were submitted to, and received political asylum. On 18 March 1957, another DC-3 (registered CP-535), which had been on a passenger flight from Cochabamba to Oruro, crashed into a mountain near Sayari. All 16 passengers and 3 crew members died. On 31 December 1959, all 11 occupants of an LAB C-47 (registered CP-584) died when the aircraft crashed shortly after take-off from an airfield near San José de Chiquitos. On 5 February 1960, a Lloyd Aéreo Boliviano Douglas DC-4 (registered CP-604), that had been on a scheduled passenger flight from Cochabamba to La Paz, crashed shortly after take-off into Laguna Huañacota, a mountain lake, following an engine fire. All 55 passengers and 4 crew members lost their lives (a two-year-old girl could be saved, but later died in hospital). On 21 August 1962, an LAB C-47 (registered CP-536) crashed near Cochabamba Airport during a post-maintenance test flight, killing four out of the five people on board. On 15 March 1963 at approximately 13:55 local time, Lloyd Aéreo Boliviano Flight 915 from Arica, Chile to La Paz, that was operated by a Douglas DC-6 (registered CP-707) on this day, crashed into Chachakumani mountain, killing all 36 passengers and three crew members. At the time of the accident, there were poor visibility conditions due to bad weather. On 4 February 1964, an LAB C-47 aircraft (registered CP-568) crashed shortly after departing Yacuiba Airport, killing two out of the 29 people on board. On 3 August 1966, an LAB C-46 (registered CP-730) that had been on a cargo flight from Riberalta to Cochabamba crashed into a mountain range of the Andes, killing all three people on board. The accident likely occurred because of a navigational error of the pilot, who had chosen a wrong flight path and subsequently had flown at the wrong altitude. On 19 April 1968, a Lloyd Aéreo Boliviano DC-3 (registered CP-734) crashed shortly after take-off from an airstrip at Trinidad. Even though the aircraft was damaged beyond repair, there were no fatalities. On 26 September 1969 at around 15:10 local time, an LAB DC-6 (registered CP-968) carrying 69 passengers and 5 crew members on a scheduled flight from Santa Cruz de la Sierra to La Paz crashed into Mount Choquetanga 176 kilometres away from the destination airport. There were no survivors when the wreckage was found after three days. Seventeen Bolivian football players had been amongst the passengers. On 16 December 1971, an LAB passenger flight from Sucre to La Paz was hijacked and demanded to be diverted to Chile. The aircraft landed at Cochabamba Airport instead, police forces stormed the plane and arrested the perpetrator. In the ensuing shooting, one crew member and one passenger were killed. On 13 October 1976 at 13:32 local time, a Jet Power Boeing 707 freighter aircraft (registered N730JP), that had been chartered by LAB to operate a cargo flight from Santa Cruz de la Sierra to Miami, crashed directly after take-off from El Trompillo Airport into a housing area and a crowded football pitch, killing the three crew members as well as 88 people on the ground, making it the deadliest air disaster in Bolivia to date. The accident had likely occurred because the pilots had not selected the correct amount of thrust, so that the aircraft did not gain sufficient height. On 23 January 1980, a LAB Fairchild F-27J (registered CP-1175) ran off a taxiway whilst being on ground at Santa Ana del Yacuma Airport and went into a ditch, during which the fuel tank was ruptured by debris from the propeller. In the ensuing fire, the aircraft was destroyed, but all 15 passengers and the three crew members could be saved. On 2 June 1980, a Lloyd Aéreo Boliviano F-27J (registered CP-1117) crashed into a hill whilst approaching Yacuiba Airport, killing the 10 passengers and three crew members on board. On 16 March 1984, another F-27M (registered CP-862) crashed, this time in a jungle somewhere between Trinidad and San Borja, claiming the lives of the 20 passengers and three crew. On 23 January 1985, a passenger detonated a bomb in a lavatory on board an LAB flight from La Paz to Santa Cruz de la Sierra, killing him. The aircraft involved, a Boeing 727-200 registered CP-1276, was substantially damaged but could safely be landed. There were no fatalities among the other 119 passengers and seven crew members. On 31 August 1991, an LAB Boeing 707 (registered CP-1365) was destroyed in a hangar fire at Dothan Regional Airport in the United States. On 22 December 1994, a Lloyd Aéreo Boliviano Fokker F27 Friendship (registered CP-2165) overran the runway at Guayaramerín Airport following a rejected takeoff and crashed into trees. All 36 passengers and four crew members survived the accident. The planned destination of the scheduled domestic flight had been San Joaquín. On 9 January 2001 at 17:20 local time, the left main landing gear of an LAB Boeing 727-200 (registered CP-2323) collapsed while taxiing at Buenos Aires Ezeiza Airport prior to a scheduled flight to Santa Cruz de la Sierra. Investigator found that the accident, by which none of the 138 passengers and 8 crew members were injured but left the aircraft damaged beyond repair, happened because of corrosion damage. On 7 August 2004, an LAB Boeing 767-300ER (registered CP-2425) experienced a hard landing at Viru Viru International Airport following a scheduled flight from Miami, and was substantially damaged. On 1 February 2008 at 10:35 local time, the pilots of an LAB Boeing 727-200 (registered CP-2429) had to execute a forced landing in a jungle clearing near Trinidad due to fuel exhaustion. The aircraft carrying 151 passengers and 8 crew had been on a scheduled flight from La Paz to Cobija, when it had to divert to Trinidad due to bad weather conditions, ultimately failing make the distance with the remaining fuel. Luckily, there were no fatalities. ^ "Directory: World Airlines". Flight International. 2007-04-03. p. 106. 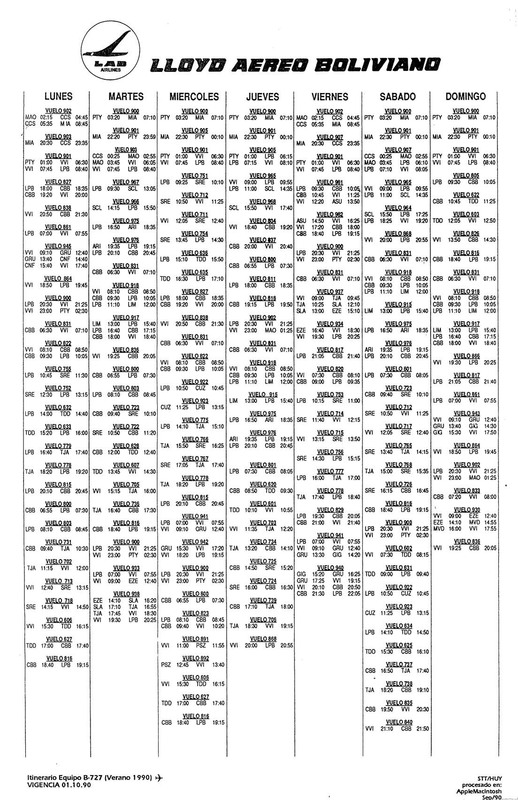 ^ "World Airline Directory." Flight International. March 21–27, 2000. 91. "Aeropuerto Jorge Wilstermann, Cochabamba, Bolivia"
^ "Bolivia's LAB airline: We regret to announce". Financial Times. August 9, 2013. Retrieved June 4, 2017. ^ "Recordando al Lloyd Aéreo Boliviano en Paraguay". Aeronáutica Paraguay (in Spanish). April 2, 2017. ^ Davies 1984, p. 330. ^ "Lloyd Aereo Boliviano". Retrieved 21 February 2017. 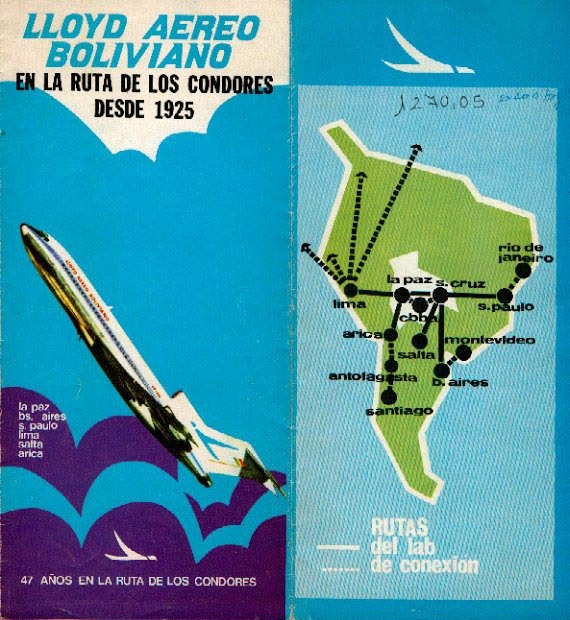 ^ "LAB - Lloyd Aéreo Boliviano". Retrieved 21 February 2017. ^ "ATDB.aero aerotransport.org AeroTransport Data Bank". Retrieved 21 February 2017. ^ Davies 1984, pp. 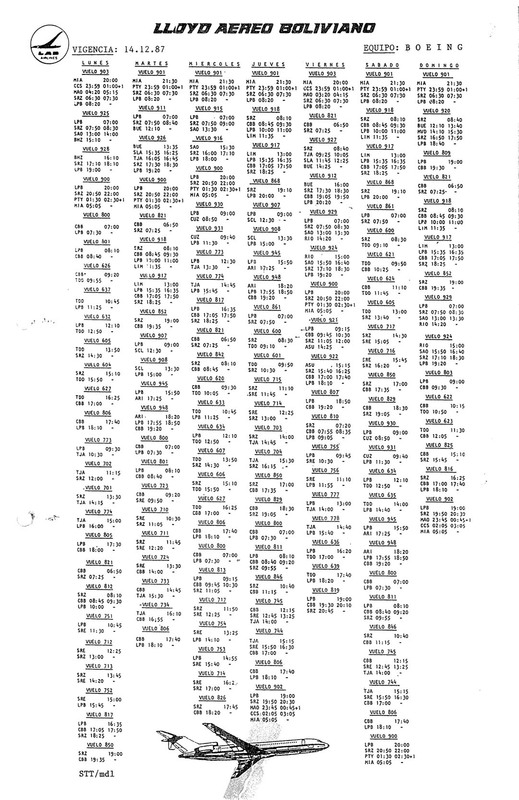 324-331, pp 604-606. ^ "ASN Aircraft accident Lockheed 18-10 Lodestar CB-25 La Paz". Aviation Safety Network. Retrieved 21 February 2017. ^ "ASN Aircraft accident Douglas C-47A-75-DL (DC-3) CB-32 Trinidad". Aviation Safety Network. Retrieved 21 February 2017. ^ "ASN Aircraft accident Curtiss C-46A-60-CK Commando CB-37 Rurrenabaque". Aviation Safety Network. Retrieved 21 February 2017. ^ "ASN Aircraft accident registration unknown". Aviation Safety Network. Retrieved 21 February 2017. ^ "ASN Aircraft accident Curtiss C-46 Commando CB-51 Cochabamba". Aviation Safety Network. Retrieved 21 February 2017. ^ "ASN Aircraft accident Curtiss C-46 CB-38 Laguna Anteojos o Azar". Aviation Safety Network. Retrieved 21 February 2017. ^ "ASN Aircraft accident Douglas C-47A-DL (DC-3) CB-31 La Paz-El Alto Airport (LPB)". Aviation Safety Network. Retrieved 21 February 2017. ^ "ASN Aircraft accident Douglas DC-3-314 CP-600 Tarabuco". Aviation Safety Network. Retrieved 21 February 2017. ^ "ASN Aircraft accident Douglas C-49E (DC-3) CP-572 Cochabamba". Aviation Safety Network. Retrieved 21 February 2017. ^ "ASN Aircraft accident Douglas C-47D (DC-3) CP-605 La Paz-El Alto Airport (LPB)". Aviation Safety Network. Retrieved 21 February 2017. ^ "ASN Aircraft accident Douglas C-53 (DC-3) CP-535 Sayari". Aviation Safety Network. Retrieved 21 February 2017. ^ "ASN Aircraft accident Douglas C-47A-70-DL (DC-3) CP-584 San Jose de Chiquitos". Aviation Safety Network. Retrieved 21 February 2017. ^ "Child Survives Plane Crash that Kills 58." Associated Press at St. Petersburg Times. Saturday February 6, 1960. 1-A. Retrieved from Google News (1 of 26) on February 27, 2010. ^ "ASN Aircraft accident Douglas DC-4 CP-609 Cochabamba-J Wilsterman Airport (CBB)". Aviation Safety Network. Retrieved 21 February 2017. ^ "ASN Aircraft accident Douglas C-47B-1-DL (DC-3) CP-536 Cochabamba Airport (CBB)". Aviation Safety Network. Retrieved 21 February 2017. ^ "ASN Aircraft accident Douglas DC-6B CP-707 Tacora Volcano". Aviation Safety Network. Retrieved 21 February 2017. ^ "ASN Aircraft accident Douglas C-47A-65-DL (DC-3) CP-568 Yacuiba Airport (BYC)". Aviation Safety Network. Retrieved 21 February 2017. ^ "ASN Aircraft accident Curtiss C-46D-15-CU Commando CP-730 Benito". Aviation Safety Network. Retrieved 21 February 2017. ^ "ASN Aircraft accident Douglas VC-47D (DC-3) CP-734 Trinidad Airport (TDD)". Aviation Safety Network. Retrieved 21 February 2017. ^ "ASN Aircraft accident Douglas DC-6B CP-698 La Paz". Aviation Safety Network. Retrieved 21 February 2017. ^ "ASN Aircraft accident Fairchild F-27 registration unknown Cochabamba". Aviation Safety Network. Retrieved 21 February 2017. ^ "ASN Aircraft accident Boeing 707-131F N730JP Santa Cruz-El Trompillo Airport (SRZ)". Aviation Safety Network. Retrieved 21 February 2017. ^ "1976: Bolivian plane crashes in Santa Cruz." BBC. Retrieved on February 27, 2010. ^ "ASN Aircraft accident Fairchild F-27J CP-1175 Santa Ana-Yacuma Airport (SBL)". Aviation Safety Network. Retrieved 21 February 2017. ^ "ASN Aircraft accident Fairchild F-27J CP-1117 Yacuiba". Aviation Safety Network. Retrieved 21 February 2017. ^ "ASN Aircraft accident Fairchild F-27M CP-862 Cerro Pilón". Aviation Safety Network. Retrieved 21 February 2017. ^ "ASN Aircraft accident Boeing 727-2K3 CP-1276 Santa Cruz". Aviation Safety Network. Retrieved 21 February 2017. ^ "ASN Aircraft accident Boeing 707-323C CP-1365 Dothan Airport, AL (DHN)". Aviation Safety Network. Retrieved 21 February 2017. ^ "ASN Aircraft accident Fokker F-27 Friendship 600 CP-2165 Guayaramerin Airport (GYA)". Aviation Safety Network. Retrieved 21 February 2017. ^ "ASN Aircraft accident Boeing 727-287 CP-2323 Buenos Aires/Ezeiza-Ministro Pistarini Airport, BA (EZE)". Aviation Safety Network. Retrieved 21 February 2017. ^ "ASN Aircraft accident Boeing 767-3P6ER CP-2425 Santa Cruz-Viru Viru International Airport (VVI)". Aviation Safety Network. Retrieved 21 February 2017. ^ "ASN Aircraft accident Boeing 727-259 CP-2429 Trinidad Airport (TDD)". Aviation Safety Network. Retrieved 21 February 2017. Wikimedia Commons has media related to Lloyd Aéreo Boliviano. This page was last edited on 13 June 2018, at 22:04 (UTC).